This episode was based on the short story 'The Disappearance of Mr. Davenheim', first published in The Sketch in 1923 (like the previous two episodes). The screenplay was written by David Renwick and the director was Andrew Grieve. The script stays more or less true to the short story. Obviously, most of Japp's retelling of the case is dramatised, but apart from that the structure is kept more or less intact. However, there are several added scenes and plot elements. First, there's an opening scene at a music hall in which Poirot, Hastings and Japp attends a magician's show (and Poirot reveals the trick! ), which develops into a subplot in which Poirot learns magic tricks from "The Boy's Book of Conjouring" (slightly out of character, but it works, and it's no surprise that someone as meticulous as Poirot succeeds). 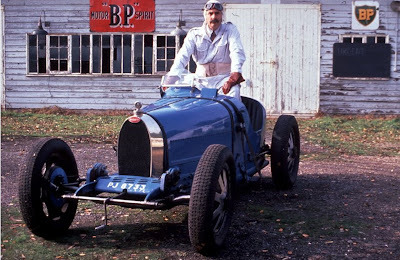 Second, there are several scenes at a race course (derived, in part, from a reference to a 'race meeting at Entfield' in the short story), in which Hastings gets to display his affection for Italian race cars (building on the car interest from Series One). Third, there's the by now infamous "Parrot for Mr Poyrott" scene (which is amusing, but I've always considered that somewhat out of tune with Christie's stories). Fourth, Miss Lemon is added to the story (but she doesn't get much to do, apart from watching Poirot do his magic tricks and serve him his tisane). Fifth, Hastings gets to investigate on behalf of Poirot (resulting in a series of funny scenes between Fraser and Jackson), particularly a scene in which he attempts to break into the safe (on Poirot's instructions - somewhat reminiscent of a scene in Murder in Mesopotamia, in which Poirot tests the sound between two rooms). Sixth, two "clues" are added to the mix; the contents of Davenheim's bathroom cabinet (razors and shaving foam, evidence of his transformation), and Tchaikovsky's '1812 Overture' (used to camouflage the break-in of the safe). All in all, though, the adaptation works and stays fairly true to its source material, apart from possibly one too many comic relief scenes (for my taste, at least). Andrew Grieve's direction is a delight to watch. There are several clever shots in this one. He utilises the beautiful location (the Davenheim house, actually 'Joldwynds' in Surrey, a house that would be used for The Theft of the Royal Ruby too). For instance, there's a wonderful shot from inside the house in which Mrs. Davenheim looks out of the main window and sees her husband disappear in the fog. Also, there's a nice shift between scenes when Lowen adjusts his moustache and Poirot adjusts his in Whitehaven. Other locations include Brooklands Museum (Surrey), which was used for the race course scene. The ghost-like soundtrack is perfect for the story (again, we have Fiachra Trench at work), and whoever came up with the idea of using the '1812 Overture' as a plot point deserves a pat on the back. It's nice to see the friendship between Poirot, Japp and Hastings develop over the course of this series. They attend shows together and have dinner at Whitehaven. Suchet gets quite a lot to play with (apparently, he did all the magic tricks himself). The house of cards is a nice reference to The Mysterious Affair at Styles and Three Act Tragedy. Of the guest actors, Mel Martin and Kenneth Colley, who play Mrs. and Mr. Davenheim, stand out. Colley almost manages to pull off the important disguise trick. The piece used to camouflage the break-in is Tchaikovsky's "1812 Overture", not Radetzky March - and the latter was composed by Johann Strauss. Just a small note, the pre-war Bugatti cars were French (not Italian). The original story starts with a discussion on whether it would be possible for someone to disappear...and the rarity of genuine amnesia...which, if you're up on Christie's life story, you can't help but find extremely funny. I believe these stories were actually written before The Disappearance. They really played the comedy for all it was worth in this one, with the parrot, and some of Hastings' lines ("I know it's a rather odd question, but a rather odd person wants to know.") And the magic, to some extent, although Poirot's success with magic is more amazing than amusing, most of the time. I think there are references in the books to him playing with cards. And Miss Lemon applauding the magic trick! She's such a fangirl, isn't she? I watched this one and then Cornish (where Poirot is right about the real murderer even though it's not the way the hard evidence points) and taken together with this one, it makes him seem vaguely magical. This is another of Christie's really good puzzles and it was well executed, except for trying to add too much comedy. If they had left out the parrot it would have been just right. I like Mel Martin's portrayal of the suffering wife...so tragic and self-contained. It's a puzzle she borrowed from Conan Doyle, though; specifically The Man With the Twisted Lip.